Around this time last year, Fall Out Boy released an album called Mania. 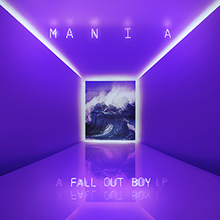 Mania had a special new color story of purple rather than their traditional blue and red albums. Fall Out Boy claimed they wanted to stray away from their usual content and branch out into different genres. Fall Out Boy has been playing music since 2001 with little variation in their music. Eventually in 2010 the band went on a hiatus of around three years. Band members, Patrick Stump (Lead vocals/rhythm guitar), Pete Wentz (backup vocals/bass) Joseph Trohman (Lead guitar), and Andy Hurley (drummer), decided they needed a break to find their writing motivation after coming up dry and fighting in the studio. Once coming back from the hiatus, they created two albums that varied their sound but also kept the old school Fall Out Boy vibes. This album had an entire new vibe. Each song was unique in their style and vibe. “Stay Frosty Royal Milk Tea” had more of a rocker vibe rather than “Sunshine Riptide” which has a more relaxed vibe. Some of my other favourites include “Wilson (Expensive Mistakes)”, “Church”, and “Bishop’s Knife Trick”. This album was not my favourite. The idea was unique but the songs didn’t flow together as well as some of their older albums did. My personal favourite album they came out with was Folie a Deux, meaning the madness of two. Every song was fluid with one another and they kept the theme all the way through. The sound was pretty and it earned my all time favourite album spot. I would recommend this album to anyone with a wide variety of music taste. This album was personally not for me, but there are some good tracks on it.